Greatly improve the audio visual quality of your Webex meeting, with professional video & audio gear. Online meetings and webcasts through Webex, Skype, GoToMeetings and others are great for 1-to-1 meetings on your laptop/desktop, but are a problem when your web meeting involves a group. It is difficult for all the presenters in your group to be heard by the PC's microphone or your speaker phone, equally difficult to hear your remote participants, and the webcam can't cover everyone who needs to be seen on the call. This affordable video conference audio system solves these problems. 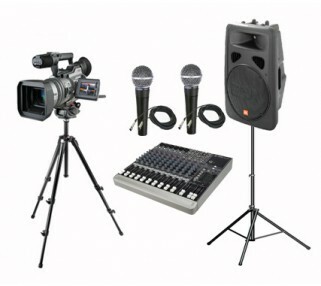 The main presenter(s) will have a professional grade microphone(s), and the remote participant's voices will be amplified in the main room through a speaker system. And one or more video cameras can be used to capture each speaker using a video switcher. An Avista technician will setup, configure, and test the system to eliminate any risk of feedback and ensure the video quality. Avista can put together the right mix of microphones, speakers and video cameras to create an effective meeting, no matter how many participants or presenters. Call us now to discuss you next web meeting.